Everyone should be able to afford a healthy meal. My mission is to provide food and beverage that is handled properly and ethically. The vegetables not being sprayed with chemicals is kept in mind when scouting out local and regional produce. The beef, chicken and pork are purchased locally from North East Kingdom Processing or Libby’s Meat Market. Ham & Hot Dogs are sourced from Mckenzie. The seafood that is sourced from the North Atlantic for peak freshness. Condiments are carefully chosen. For instance pink salt, raw sugar & fresh cracked pepper are used to achieve the best flavor from it’s purity. BPA free products are sought out. Water without fluoride is brought in. The beverages are geared towards the seasonality. In the summer you will see Lemonade with local black currant juice. In the fall hot cider is featured. Those are just a couple of examples of the beverages that change throughout the season. As far as consistent beverage options sourced with a purpose I have spindrift seltzer waters. For anyone who wants to feel nostalgic Mexican Coca Cola with pure cane sugar is served up. To go containers are green. The product served inside of it is made from scratch or sourced from a company in Vermont. Wagon made bread & pickles are a favorite. The seasonality of the product and whether are crucial towards deciding what daily specials are going to be. GMO free is a priority. Also having various options available such as gluten free, vegan, vegetarian, lactose free & other dietary options are a priority towards the type of customers who enjoy my food. The most popular item sought out by the locals is the Cubano. It’s preparation is Cuban. 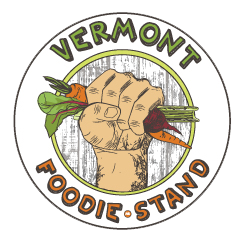 The ingredients are Vermont. Also the Hot Dog & Burgers are served up modestly & also with eclectic flair. The grilled Cheese is served with Cabot cheddar, Swiss & American. Then truffle fries get served up as a side. Hand cut fries, dusting of pink salt, parm cheese, minced parsley then tossed & misted with truffle oil. This mission is a lifestyle for me now. It feels great to serve up food that has the quality of what my grandparents had to work with. Unfortunately, corporations and greed have made this a task. Eating REAL food should come naturally.